I am finally bringing workshop to my home base, the Washington, DC area. I am putting on a my “Social Design for the Enterprise” half-day workshop on the afternoon of July 17th at Viget Labs (register from this prior link). Yes, it is a Friday in the Summer in Washington, DC area. This is the filter to sort out who really wants to improve what they offer and how successful they want their products and solutions to be. Is the Workshop Only for Designers? No, the workshop is aimed at a broad audience. The focus of the workshop gets beyond the tools’ features and functionality to provide understanding of the other elements that make a giant difference in adoption, use, and value derived by people using and the system owners. The workshop is for user experience designers (information architects, interaction designers, social interaction designers, etc. ), developers, product managers, buyers, implementers, and those with social tools running already running. This workshop with address problems for designing social tools for much better adoption in the enterprise (in-house use in business, government, & non-profit), but web facing social tools. Designing for social comfort requires understanding how people interact in a non-mediated environment and what realities that we know from that understanding must we include in our design and development for use and adoption of our digital social tools if we want optimal adoption and use. Tools do not need to be constrained by accepting the 1-9-90 myth. Using the for elements for enterprise social tool success (as well as web facing) to better understand where and how to focus understanding gaps and needs for improvement. For more information and registration to to Viget Lab's Social Design for the Enterprise page. Posted at 2:38 AM from Bethesda, Maryland. Posted at 2:36 AM from Bethesda, Maryland. I have finally blogged about the different between the two terms of collaborative and collective, which has been something bugging me for some time. Comments there are open, but are moderated (as they always have been). Those who have been to any of my workshops in the past year or so will see familiar information. Hopefully, the post will help those discussing and crafting social tools for the general web (or mobile) or large organizations will read and work to grasp the difference. I have had plenty of academics, researchers, and service developers push me to make this public for far too long so to start getting the misunderstanding around the two terms corrected. Posted at 5:38 AM from Bethesda, Maryland. ASIS&T has a new event they are putting on this year, the Social Computing Summit in Miami, Florida on April 10-11, 2008 (a reminder page is up at Yahoo's Upcoming - Social Computing Summit). The event is a single-track event on both days with keynote presentations, panels, and discussion. The opening keynote is by Nancy Baym. I have been helping assist with organization of the Social Computing Summit and was asked by the other organizers to speak, which I am doing on the second day. The conference is a mix of academic, consumer, and business perspectives across social networking, politics, mobile, developing world, research, enterprise, open social networks (social graph and portable social networks) as well as other subjects. The Summit will be a broad view of the digital social world and the current state of understanding from various leaders in social computing. There is an open call for posters for the event that closes on February 25, 2008. Please submit as this is looking to be a great event and more perspectives and expertise will only make this event more fantastic. Posted at 2:53 PM from Bethesda, Maryland. You may be familiar with my granular social network post and the postings around the Personal InfoCloud posts that get to personal privacy and personal management of information we have seen, along with the Come to Me Web, but there is an element that is still missing and few social web sites actually grasp the concept. This concept is granular in the way that the granular social network is granular, which focusses on moving away from the concept of "broad line friends" that focus on our interest in everything people we "friend", which is not a close approximation of the non-digital world of friend that we are lucky to find friends who have 80 percent common interests. This bit that is missing focusses on the sharing and following (or listening) aspects of our digital relationships. Getting closer to this will help filter information we receive and share to ease the overflow of information and make the services far more valuable to the people using them. Twitter in its latest modifications is beginning to show that it is grasping what we are doing online is not befriending people or claiming friend, but we are "following" people. This is a nice change, but it is only part of the equation that has a few more variables to it, which I have now been presenting for quite a few years (yes and am finally getting around to writing about). The other variables are the sharing and rough facets of type of information we share. When we start breaking this down we can start understanding the basic foundation for building a social web application that can begin to be functional for our spheres of sociality. There are echos of James Surowiecki's Wisdom of Crowds in the Spheres of Sociality as they break down as follows. The personal sphere is information that is just for one's self and it is not shared with others. The selective sphere, which there may be many a person shares with and listens to, are closed groups that people are comfortable sharing and participating with on common interests (family, small work projects, small group of friends or colleagues, etc.). The collective sphere is everybody using that social tool that are members of it, which has some common (precise or vague) understanding of what that service/site is about. The last sphere is the mob, which are those people outside the service and are not participants and who likely do not understand the workings or terminology of the service. These sphere help us understand how people interact in real life as well as in these social environments. Many of the social web tools have elements of some of these or all of these spheres. Few social web tools provide the ability to have many selective spheres, but this is a need inside most enterprise and corporate sites as there are often small project teams working on things that may or may not come to fruition (this will be a future blog post). Many services allow for just sharing with those you grant to be your followers (like Twitter, Flickr, the old Yahoo! MyWeb 2.0, and Ma.gnolia private groups, etc.). This selective and segmented group of friends needs a little more examination and a little more understanding. The concepts that are needed to improve upon what has already been set in the Spheres of Sociality revolve around breaking down sharing and following (listening) into more discernible chunks that better reflect our interests. We need to do this because we do not always want to listen everything people we are willing to share with are surfacing. But, the converse is also true we may not want to share or need to share everything with people we want to follow (listen to). In addition to each relationship needing to have sharing and listening properties, the broad brush painted by sharing and listening also needs to be broken down just a little (it could and should be quite granular should people want to reflect their real interests in their relationships) to some core facets. The core facets should have the ability to share and listen based on location, e.g. a person may only want to share or listen to people when they are in or near their location (keeping in mind people's location often changes, particularly for those that travel or move often). The location facet is likely the most requested tool particularly for those listening when people talk about Twitter and Facebook. Having some granular categories or tags to use as filters for sharing and listening makes sense as well. This can break down to simple elements like work, play, family, travel, etc. as broad categories it could help filter items from the sharing or listening streams and help bring to focus that which is of interest. Where this gets us it to an ability to quickly flag the importance of our interactions with others with whom we share information/objects. Some things we can set on an item level, like sharing or just for self, and if sharing with what parameters are we sharing things. We will set the default sharing with ourself on so we have access to everything we do. This follows the Spheres of Sociality with just personal use, sharing with selective groups (which ones), share with the collective group or service, and share outside the service. That starts setting privacy of information that starts accounting for personal and work information and who could see it. Various services have different levels of this, but it is a rare consumer services that has the selective service sorted out (Pownce comes close with the options for granularity, but Flickr has the ease of use and levels of access. For each item we share we should have the ability to control access to that item, to just self or out across the Spheres of Sociality to the mob, if we so wish. Now we can get beyond the item level to presetting people with normative rights. We can set people with properties that will help use with default Sphere of Sociality for sharing and listening. The two directions of communication really must be broken out as there are some people we do not mind them listening to the selective information sharing, but we may not have interest in listening to their normal flow of offerings (optimally we should be able to hear their responses when they are commenting on items we share). Conversely, there may be people we want to listen to and we do not want to share with, as we may not know them well enough to share or they may have broken our privacy considerations in the past, hence we do not trust them. For various reasons we need to be able to decide on a person level if we want to share and listen to that person. Not, only do we have needs and desires for filtering what we share and listen to on the person level, but if we have a means to set some more granular levels of sharing, even at a high level (family, work, personal relation, acquaintance, etc.). If we can set some of these facets for sharing and have them tied to the Spheres we can easily control who and what we share and listen to. Flickr does this quite well with the simple family, friends, contacts, and all buckets, even if people do not use them precisely as such as family and friends are the two selective buckets they offer to work with (most people I know do not uses them precisely as such with those titles, but it provides a means of selective sharing and listening). Lastly, it is often a request to filter listening and sharing by geography/location access. There are people who travel quite a bit and want to listen and share with people that are currently local or will be local to them in a short period, but their normal conversations are not fully relevant outside that location. Many people want the ability not to listen to a person unless they are local, but when a person who has some relationship becomes local the conversation may want to be shared and/or listened to. These settings can be dependent on the granular listening and sharing parameters, or may be different. So, now that this is out there it is done? Hmmm, if it were only so easy. The first step is getting developers of social web and social software to begin understanding the social relationships that are less broad lines and more granular and directional. The next step is a social interaction that people need to understand or that the people building the interfaces need to understand, which is if and how to tell people the rights granted are not reciprocal (it is seems to be a common human trait to have angst over non-reciprocal social interactions, but it is the digital realm that makes it more apparent that the flesh world). Posted at 1:55 AM from Bethesda, Maryland. Communicating is simple. Well it is simple at its core of one person talking with another person face-to-face. When we communicate and add technology into the mix (phone, video-chat, text message, etc.) it becomes more difficult. Technology becomes noise in the pure flow of communication. But, what we have today is even more complex and difficult as we are often holding conversation across many of these technologies. The communication streams (the back and forth communication between two or more people) are now often not contained in on communication channel (channel is the flavor or medium used to communicate, such as AIM, SMS, Twitter, e-mail, mobile phone, etc.). We are seeing our communications move across channels, which can be good as this is fluid and keeping with our digital presence. More often than not we are seeing our communication streams fracture across channels. This fracturing becomes really apparent when we are trying to reconstruct our communication stream. I am finding this fracturing and attempting to stitch the stream back together becoming more and more common as for those who are moving into and across many applications and devices with their own messaging systems. The communication streams fracture as we pick-up an idea or need from Twitter, then direct respond in Twitter that moves it to SMS, the SMS text message is responded back to in regular SMS outside of Twitter, a few volleys back and forth in SMS text, then one person leaves a voicemail, it is responded to in an e-mail, there are two responses back and forth in e-mail, an hour later both people are on Skype and chat there, in Skype chat they decide to meet in person. Why Do We Want to Stitch the Communication Stream Together? When they meet there is a little confusion over there being no written overview and guide. Both parties are sure they talked about it, but have different understandings of what was agreed upon. Having the communication fractured across channels makes reconstruction of the conversation problematic today. The conversation needs to be stitched back together using time stamps to reconstruct everything [the misunderstanding revolved around recommendations as one person understands that to mean a written document and the other it does not mean that]. Increasingly the reality of our personal and professional lives is this cross channel communication stream. Some want to limit the problem by keeping to just one channel through the process. While this is well intentioned it does not meet reality of today. Increasingly, the informal networking leads to meaningful conversations, but the conversations drifts across channels and mediums. Pushing a natural flow, as it currently stands, does not seem to be the best solution in the long run. Why Does Conversation Drift Across Channels? There are a few reasons conversations drift across channels and mediums. One reason is presence as when two people notice proximity on a channel they will use that channel to communicate. When a person is seen as present, by availability or recently posting a message in the service, it can be a prompt to communicate. Many times when the conversation starts in a presence channel it will move to another channel or medium. This shift can be driven by personal preference or putting the conversation in a medium or channel that is more conducive for the conversation style between people involved. Some people have a preferred medium for all their conversations, such as text messaging (SMS), e-mail, voice on phone, video chat, IM, etc.. While other people have a preferred medium for certain types of conversation, like quick and short questions on SMS, long single responses in e-mail, and extended conversations in IM. Some people prefer to keep their short messages in the channel where they begin, such as conversations that start in Facebook may stay there. While other people do not pay attention to message or conversation length and prefer conversations in one channel over others. Since there are more than a few reasons for the fractured communications to occur it is something that needs resolution. One solution is making all conversations open and use public APIs for the tools to pull the conversations together. This may be the quickest means to get to capturing and stitching the conversation thread back together today. While viable there are many conversations in our lives that we do not want public for one reason or many. Another solution is to try to keep your conversations in channels that we can capture for our own use (optimally this should be easily sharable with the person we had the conversation with, while still remaining private). This may be where we should be heading in the near future. Tools like Twitter have become a bridge between web and SMS, which allows us to capture SMS conversations in an interface that can be easily pointed to and stitched back together with other parts of a conversation. E-mail is relatively easy to thread, if done in a web interface and/or with some tagging to pull pieces in from across different e-mail addresses. Skype chat also allows for SMS interactions and allows for them to be captured, searched, and pulled back together. IM conversations can easily be saved out and often each item is time stamped for easy stitching. VoIP conversations are often easily recorded (we are asking permission first, right?) and can be transcribed by hand accurately or be transcribed relatively accurately via speech-to-text tools. Voice-mail can now be captured and threaded using speech-to-text services or even is pushed as an attachment into e-mail in services as (and similar to) JConnect. Who Will Make This Effortless? There are three types of service that are or should be building this stitching together the fractured communications across channels into one threaded stream. I see tools that are already stitching out public (or partially public) lifestreams into one flow as one player in this pre-emergent market (Facebook, Jaiku, etc.). 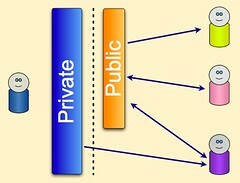 The other public player would be telecoms (or network provider) companies providing this as a service as they currently are providing some of these services, but as their markets get lost to VoIP, e-mail, on-line community messaging, Second Life, etc., they need to provide a service that keeps them viable (regulation is not a viable solution in the long run). Lastly, for those that do not trust or want their conversation streams in others hands the personally controlled application will become a solutions, it seems that Skype could be on its way to providing this. I am regularly fielding questions along these lines from enterprise as they are trying to deal with these issues for employees who have lost or can not put their hands on vital customer conversations or essential bits of information that can make the difference in delivering what their customers expect from them. Many have been using Cisco networking solutions that have some of these capabilities, but still not providing a catch all. I am getting queries from various telecom companies as they see reflections of where they would like to be providing tools in a Come to Me Web or facilitating bits of the Personal InfoCloud. I am getting requests from many professionals that want this type of solution for their lives. I am also getting queries from many who are considering building these tools, or pieces of them. Some of us need these solutions now. Nearly all of us will need these solutions in the very near future. Posted at 2:13 AM from Bethesda, Maryland. The past two days have brought back many memories that have reminded me of the advances in technology as well as the reliance on technology. The demonstration yesterday showed concepts that were nearly the exact concept from my past, but with a really nice interface (one that was not even possible in 1999 or 2000). I was ecstatic with the interface and the excellent job done on the prototype. I realized once again of the technical advances that make rich web interfaces of "Web 2.0" (for lack of a better term) possible. I have seen little new in the world of Ajax or rich interfaces that was not attempted in 2000 or 2001, but now they are viable as many people's machines can now drive this beauties. I am also reminded of the past technologies as that is what I am running today. All I have at my beck and call is two 667MHz machines. One is an Apple TiBook (with 1 GB of RAM) and one is a Windows machine (killer graphics card with 256MB video RAM and 500MB memory). Both have problems with Amazon and Twitter with their rich interfaces. The sites are really slow and eat many of the relatively few resources I have at my disposal. My browsers are not blowing up, but it feels like they could. The past year or two I have been using my laptop as my outboard memory. More and more I am learning to trust my devices to remind me and keep track of complex projects across many contexts. Once things are in a system I trust they are mostly out of my head. This experience came to a big bump two days ago when my hard drive crashed. The iterative back-ups were corrupted or faulty (mostly due to a permission issue that would alter me in the middle of the night). The full back-up was delayed as I do not travel with an external drive to do my regular back-ups. My regularly scheduled back-ups seem to trigger when I am on travel. I am now about 2.5 months out from my last good full back-up. I found an e-mail back-up that functioned from about 3 weeks after that last full backup. Ironically, I was in the midst of cleaning up my e-mail for back-up, which is the first step to my major back-up, when the failure happened. I have a lot of business work that is sitting in the middle of that pile. I also have a lot of new contacts and tasks in the middle of that period. I have my client work saved out, but agreements and new pitches are in the mire of limbo. Many people are trying to sync and back-up their lives on a regular basis, but the technology is still faulty. So many people have faulty syncing, no matter what technologies they are using. Most people have more than two devices in their life (work and home computer, smart phone, PDA, mobile phone with syncable address book and calendar, iPod, and other assorted options) and the syncing still works best (often passably) between two devices. Now when we start including web services things get really messy as people try to work on-line and off-line across their devices. The technology has not caught up as most devices are marketed and built to solve a problem between two devices and area of information need. The solutions are short sighted. Last week I attended the University of North Carolina Social Software Symposium (UNC SSS) and while much of the conversation was around social software (including tagging/folksonomy) the discussion of technology use crept in. The topic of digital identity was around the edges. The topic of trust, both in people and technology was in the air. These are very important concepts (technology use, digital identity, and trusted technology and trusted people). There is an intersection of the technosocial where people communicate with their devices and through their devices. The technology layer must be understood as to the impact is has on communication. Communication mediated by any technology requires an understanding of how much of the pure signal of communication is lost and warped (it can be modified in a positive manner too when there are disabilities involved). Our digital communications are improving when we understand the limitations and the capabilities of the technologies involved (be it a web browser of many varied options or mobile phone, etc.). Learning the capabilities of these trusted devices and understanding that they know us and they hold our lives together for us and protect our stuff from peering eyes of others. These trusted devices communicate and share with other trusted devices as well as our trusted services and the people in our lives we trust. Seeing OpenID in action and work well gave me hope we are getting close on some of these fronts (more on this in another post). Seeing some of the great brains thinking and talking about social software was quite refreshing as well. The ability to build solid systems that augment our lives and bring those near in thought just one click away is here. It is even better than before with the potential for easier interaction, collaboration, and honing of ideas at our doorstep. The ability to build an interface across data sets (stuff I was working on in 1999 that shortened the 3 months to get data on your desk to minutes, even after running analytics and working with a GIS interface) can be done in hours where getting access to the wide variety of information took weeks and months in the past. Getting access to data in our devices to provide location information with those we trust (those we did not trust have had this info for some time and now we can take that back) enables many new services to work on our behalf while protecting our wishes for whom we would like the information shared with. Having trusted devices working together helps heal the fractures in our data losses, while keeping it safe from those we do not wish to have access. The secure transmission of our data between our trusted devices and securely shared with those we trust is quickly arriving. I am hoping the next time I have a fatal hard drive crash it is not noticeable and the data loss is self-healed by pulling things back together from resources I have trust (well placed trust that is verifiable - hopefully). This is the Personal InfoCloud and its dealing with a Local InfoCloud all securely built with trusted components. Odd Moments in the Day - Odd Moments with Technology? Today brought an odd moment. I looked up at iChat (my IM interface) and I see my name (Thomas Vander Wal) and podcast under Jeremy's name, which means Jeremy is most likely listening to a podcast interview with me. I had never seen that before. Now I decide to share that odd moment with Jeremy, which I did not realize would cause Jeremy to have an odd moment. How can the world of pervasive/ubiquitous computing ever get off the ground when we give each other odd moments through our friendly stalking? By the way I prefer using stalking, where as some people like the term monitoring, but the term monitoring does not cause me to think about privacy implications that I believe we must resolve within ourself or learn to better protect our privacy. The incident today still causes me to chuckle for a short moment then realize how open we are with things on the internet and how different that seems to be even though most of our life has been public, but to a smaller and more localized group. It also resignals that change that came with the internet (well and much of technology) is that we can not see those who can see us. In a town we know the local video store guy knows what we rent, but now Amazon knows what we bought as do those people on our friends list whom we share our purchases with so they can have some insight as what to buy. My local video store guy in San Francisco, near California and 2nd or 3rd Avenue, was amazing. He knew everything I rented in the last few months and would provide perfect recommendations. Did he use a computer to aid himself? Nope, he was just that good and his brain could keep the connection between a face and videos rented and if you liked that video. He knew my taste perfectly and was dead on with recommendations. Not only was he on with me, but most others who frequented his store. He was great recommending, but also could help people avoid movies they did not like. So, with technology as an intermediary or as the memory tool what is so freaky? Is it not seeing into somebody's eyes? Is it the magic or somebody more than 3,000 miles away knowing what you are listening to and then have the person whom you are listening to pop-up for a chat? I think it is we have collapsed space and human norms. It is also difficult to judge intent with out seeing face or eyes. I was in a back and forth recently with a friend, but could not sense their intent as it seemed like the tone was harsh (for a person whom I trust quite a bit and think of as being intensely kind and giving) and I finally had to write and ask, but it was written from a point where I was bothered by the tone. My problem was I could not see the eyes of the person and see they playfulness or gestures to know their intent was playful challenging. While at the Information Architecture Summit a couple/few weeks ago in Vancouver a few of us went to dinner and we played werewolf (my first time playing). But, I was reminded that the eyes hold a lot of information and carry a lot of weight in non-verbal communication. I could pick the werewolf whose eyes I could see, but in two occasions the werewolf was sitting next to me and I could not see their eyes. There was one person in each of the two games whom I did think was the werewolf as their eyes were signaling similarly to people who were not telling the truth in the cultures I grew up in. Could technology be more easily embraced if it had eyes? Should we have glancing as Matt Webb has suggested and built an application to suggest? But could we take Matt'a concept farther? Would it be helpful? This was a long post of what was just going to be pointing out an odd moment in the day. Posted at 1:19 PM from Bethesda, Maryland. An example of folkonomy beyond the web. In a Flickr comment the person describes objects they found and strangers properly annotated. Folksonomy is not the content owner or creator tagging and annotating it is others. This is quite apropos as Flickr, while not offering full tagging by others (if a photo is tagged orange, there is no reason (or way) for others to additionally tag the photo orange, which I wish would get fixed) Flickr does offer the ability for others to comment fully and add knowledge (or humor) to the photos. The string of comments, which this example is pulled is from a query Esther Dyson posted about the type of tree she photographed. Knowledge does not have to come from within but can come from around us as a collective. Posted at 12:48 AM from Bethesda, Maryland. I bought and read one standout book this year, Malcolm McCullough's Digital Ground mixed in with many more that I enjoyed. Digital Ground stood out as it combined a lot of things I had been thinking about, but had not quite pulled together. It brought interaction design front and center in the ubiquitous computing and mobile computing spectrum. I have been working on the Personal InfoCloud for a few years now and this really moved my thinking forward in a great leap. I considering better questions and realizing there are many next step, but few of these next steps the design community (in the broad user experience design sense) seems ready for at this time. One of the key components that is not was thought through is interaction design and the difference place makes in interaction design. It was one book that got my highlighter out and marking up, which few books have done in the past couple years. I greatly enjoyed the troika of books on the mind that came out in 2004. The first was Mind Wide Open by Stephen Berlin Johnson, which was a relatively easy read and brought to mind much of how we use are minds in our daily lives, but also how we must think of the coginitive processes in our design work. Mind Wide Open focussed on improving one's attention, which is helpful in many situations, but I have had a running question ever since reading the book regarding focus of attention and creative problem resolution (I do not see focus of attention good for creative problem resolution). The second book was On Intelligence by Jeff Hawkins. On Intelligence is similar to Mind Wide Open, but with a different frame of reference. Hawkins tries to understand intelligence through refocussing on predictive qualities and not so much on results based evaluation (Turing Test). I really like the Hawkins book, which throws in some guesses in with scientifically proven (unfortunately these guesses are not easily flagged), but the predictive qualities and the need for computing to handle some of the predictive qualities to improve people's ability to handle the flood of information. Lastly, for in the mind book troika I picked up and have been reading Mind Hacks by Tom Stafford and Matt Webb. This is one of the O'Reilly Hack series of books, but rather than focussing on software, programming, or hardware solutions these to gents focus on the mind. Mind tricks, games, and wonderful explainations really bring to life the perceptions and capabilites of the grey lump in our head. I have been really enjoying this as bedtime reading. Others in related genres that I have read this year, Me++: The Cyborg Self in the Networked City by William Mitchell, which was not a soaring book for me, mostly because Ihad just read Digital Ground and it should have been read in the opposite order, if I had cared to. Linked: How Everything is Connected to Everything Else and What it Meands by Albert-Laszlo Barabasi was a wonderful read, once I got through the first 20 pages or so. I had purched the book in hardback when it first came out and I was not taken by the book in the first 20 pages. This time I got past those pages and loved every page that followed. Barabasi does a wonderful job explaining and illustrating the network effect and the power curve. This has been incorporated into my regular understanding of how things work on the internet. I have learned not to see the power curve as a bad thing, but as something that has opportunities all through out the curve, even in the long tail. On the way back from Amsterdam I finally read Invisible Cities by Italo Calvino, which was quite a wonderful end to that trip. I picked up a few reference books that I enjoyed this year and have bought this year and have proven to be quite helpful. 250 HTML and Web Design Secrets by Molly Holzschlag. CSS Cookbook by Chris Schmitt. More Eric Meyer on CSS by Eric Meyer. On the Apple/Mac front the following reference books have been good finds this year. Mac OS X Unwired by Tom Negrino and Dori Smith. Mac OS X Power Hound by Rob Griffths. Two very god books for those just starting out with web design (Molly's book above would be a good choice also). Web Design on a Shoestring by Carrie Bickner. Creating a Web Page with HTML : Visual QuickProject Guide by Elizabeth Castro. The year started and ended with two wonderful Science Fiction romps. Eastern Standard Tribe by Cory Doctorow. Jennifer Government by Max Barry. Update: I knew I would miss one or more books. I am very happy that 37signals published their Defensive Design for the Web: How To Improve Error Messages, Help, Forms, and Other Crisis Points, as it is one of the best books for applications and web development on how to get the little things right. The tips in the book are essential for getting things right for the people using the site, if these essentials are missed the site or application is bordering on poor. Professionally built sites and applications should work toward meeting everything in this book, as it is not rocket science and it makes a huge difference. Every application developer should have this book and read it. I went on a little book buying spree this past week as I am finishing reading the last binge buy or two. I picked up a couple O'Reilly reference books (will review them later) and a few books from the interaction design, cogsci, and information design arena. The one that is standing out in as I preview them is the Visual Rhetoric in a Digital World : A Critical Sourcebook by Carolyn Handa. This book is a collection of essays and articles from various well quoted and referred to designers, writers, and academics. Looking through the references and end-notes the heros of communication research are used for the foundations of those chosen to write. Visual Rhetoric is focussed on the academic world, but if we are not learning every day we will never get better, and this book could fill in the gaps. The book is broken into five sections: Toward a Pedagogy of the Visual, The Rhetoric of the Image, The Rhetoric of Design, Visual Rhetoric and Argument, and Visual Rhetoric and Culture. The names of the writers that jump out are Gunter Kress, Catherine L. Hobbes, J.L. Lemke, Rudolph Arnheim, Roland Barthes, Scott McCloud, Jeffery Keedy, Jessica Helfand, Keith Kenney, Michele S. Shauf, Richard A. Lanham, Robert Horn, and Bell Hooks drew my attention. I have a very strong feeling this will be a great resource. I don't think it will bump Digital Ground by Malcolm McCullough from my vote for the best book I have read this year, but it is proving 2004 is a very strong year for books. Posted at 9:11 PM from Bethesda, Maryland. Peter Lind post a great overview of semiotics and a what is semiotics, part 2 on his ever useful Tesugen weblog. Posted at 5:41 PM from Bethesda, Maryland. Zeldman explains the differences between differences between design and communication. Posted at 8:06 AM from Bethesda, Maryland. Posted at 10:07 PM from Bethesda, Maryland. Beginning with a discussion with Stewart on Peterme and the encouragement of Lane in another discussion to look for a metaphor other than navigation that could better explain what we do on the Web. Seeing Stewart walk by at SXSW after I had seen some of Josh Davis visual plays I combined the discussion with Stewart with the magnetic attraction Josh showed, which began my thinking about a metaphor of attraction. Magnetism seems like what happens when we put a search term in Google, it attracts information that is draw to the term on to your screen. Come see where else this metaphor can go in this poorly written for draft of the metaphor of attraction. This is posted to begin a collaboration to dig back and move forward, if that is where this is to go. The writing will improve and the ideas will jell into a better presentation over the next few weeks. One of the reasons that I love the Internet is its ability to be a conduit for exchanging ideas and discussion of topics. Not that this is not is new, it isn't. The comment tools in use on Web pages provides the ability to not only share ideas, but capture them for further use. Discussions are not lost in the ether as they can be at conferences, but they are stored for later reference. This has been going on the past few days at Peter's site in a discussion about the term of use, Information Architect. The discussion has somewhat turned to the use of spatial metaphors to describe the Web and its use. None of the participants are really with in a short drive of each other. We are all sharpening our knowledge and ideas and changing perspectives to some degree. The Internet provides an amazing resource for life learners and bringing people of similar mind together to interact. Posted at 2:06 PM from Bethesda, Maryland. I really enjoyed reading Jef Raskin's "There is No Such Thing as Information Design". This takes me right back to communication theory class. To be specific Jef clarifies with, "Information cannot be designed; what can be designed are the modes of transfer and the representations of information. This is inherent in the nature of information, and it is important for designers to keep the concepts of information and meaning distinct." Posted at 9:28 PM from Bethesda, Maryland.